In this article I’ll explain how and where to book a hotel (or hostel) in Vietnam. If you’re interested in booking a hotel in a specific city, click here to read our reviews. If you need firsthand information on how plan your travel in Vietnam, click here to read our complete guide. Which online portal should I use to book a hotel in Vietnam? Hoi An located in the Vietnamese province of Quang Nam is one of the most popular touristic destination in Vietnam because of its well-preserved ancient trading port. Finding a good place to stay in Hoi An can be difficult because of the large number of options available. Here you’ll find the review of the best hotels whatever your budget may be. If you are interested in the general idea of how to book hotels in Vietnam, you can read our recommendations here. Sunrise Premium Resort Hoi An is a gorgeous resort in Hoi An with beautiful rooms and villas to accommodate smaller families to larger families. It features two bedroom villas for larger families offering breathtaking views of the ocean front and Deluxe rooms for couples and smaller families. The resort offers all inclusive packages to make the stay hassle-free. The staff is attentive, friendly, and goes out of the way to help out the guests with their needs and enquiries. 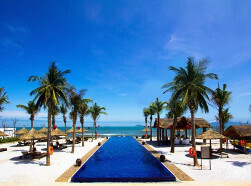 The resort is 25.69 km away from the Da Nang Airport and only 6.17 km from the Nguyen Tat Thanh Bus Station. It is a great choice for families with kids as it offers services like kids club, kid’s swimming pool, family room, playground and babysitting service. The rooms are high on cleanliness and offer garden, pool, and oceanfront views. Stay connected throughout the stay with free Wi-Fi provided in rooms and public area. The resort offers exceptional facilities and services in addition to friendly staff who also speaks fluent English to cater to guests from western part of the world. Hanoi, capital of Vietnam is the biggest city of the country and the second in population. Here you’ll find any kind of hotels, from the cheapest hostel to the most expensive 5 stars hotel. Given its extension, finding the right hotel may be a challenge, especially if you don’t know the city. This guide features a selection of the best hotels in Hanoi, whatever your budget may be. In this guide we have selected hotels in two different areas, downtown and near Noi Bai Airport. If your looking for a general recommendations on booking hotels in Vietnam you can click here to read our guide. 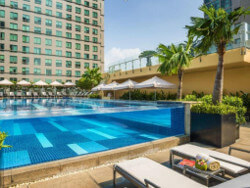 Sofitel Legend Metropole Hanoi Hotel The Sofitel Legend Metropole Hanoi Hotel is one of the top hotels in Hoan Kiem District’s French Quarter that not only enjoys great location amid must-see attractions but also provides excellent facilities. The hotel features 364 smoke-free rooms with many categories to suit guest’s needs and budget. Some of its top services include child-friendly services, train station pick-up service, full service spa, an outdoor swimming pool, and 3 restaurants. It is located at a distance of 3.61 km from the Gia Lam Aiport while the Hanoi Railway Station is 1.39 km away. The hotel is also a popular stay option for western travellers. The staff is friendly, attentive to guest’s needs, and speaks fluent English, French, German, and Japanese for effective communication with guests from different countries. Free Wi-Fi in all rooms, facilities for disabled, room service, and child friendly services are some of the added benefits of staying at the hotel. Halong City located in the Vietnamese province of Quảng Ninh is one of the most popular touristic destination in Vietnam because of the Halong Bay a spectacular natural site declared UNESCO World Heritage Site in 1994. Finding a good place to stay in Halong can be difficult because of the large number of options available. Here you’ll find the review of the best hotels and cruises whatever your budget may be. 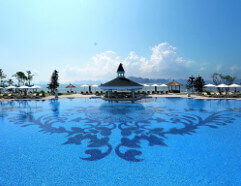 Offering gorgeous sea views, the Vinpearl Ha Long Bay Resort is a beautiful beach resort with 384 guestrooms and exceptional facilities. The hotel is located in the Quang Ninh area of Vietnam, 9 km away from the city center. Since it is located right on the beach, it allows guests to enjoy the most of the beach away from the city’s hustle-bustle. The Ha Long Night Market and Cho Bai Chay is only 32 minute walk away. Some of the top facilities at the hotel include free Wi-Fi across the property, free buffet breakfast, and airport transfer. 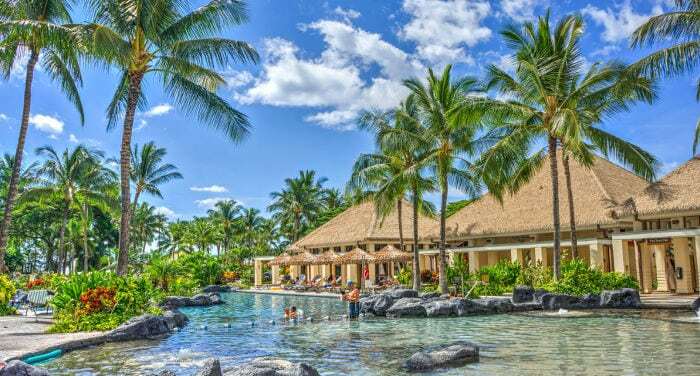 In addition, free shuttle service, child-friendly services like babysitting, children’s pool, free cribs and pet lodging further add to its exceptional services. The private beach, indoor and outdoor swimming pools, tennis court, spa, BBQ facilities ensure the guests have a great time at the hotel in addition to staying in comfy and luxurious rooms. English speaking staff makes the stay for guests from Western countries even more comfy at the hotel. Ho Chi Minh City also known as Saigon is the biggest city in Vietnam and a top touristic destination. Here you’ll find more hotels that you can count, which may make choosing where to stay extremely difficult. This guide is a selection of the best hotels in Ho Chi Minh City (both in the city center and close to the airport), whatever your budget may be. If your looking for general recommendations on booking hotels in Vietnam you can click here to read our guide. The InterContinental Asiana Saigon is a big hotel with 305 guestrooms featuring many categories to suit guest’s different preferences and needs. 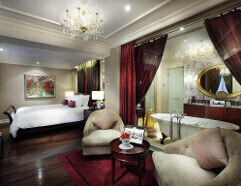 The rooms are spacious and beautifully done up in earthy tones and chic furniture for contemporary ambiance. The hotel is located in District 1, which makes it easily accessible from Tan Son Nhat International Airport. Ho Chi Minh City Notre Dame Cathedral, Diamond Plaza, and Saigon Notre Dame Basilica are only 3 minute walk away. From family friendly services like babysitting services, connecting rooms and in room childcare to a technologically advanced conference center, the hotel is ideal for couples, families, and business travelers. For beautiful panoramic views of the city from the higher floors of the hotel, go for the Club Rooms that not just offer great views but exceptional service by the club manager who is more like a personal concierge. The hotel also takes care of fuzzy guests and welcomes them to stay with their owners. The hotel provides free Wi-Fi in all rooms and public areas to keep the guests connected to the world all the time. The restaurants here serve South East Asian, Vietnamese, Cantonese, and French cuisines. Choosing a good hotel in Hué, the ancient imperial capital of Vietnam can be a difficult task due to the large number of hotels that exist and because in this touristic spot, many of the hotels are of doubtful quality. In this article, you will find a review of the best hotels in the city, whatever your budget may be. A beautiful property with plenty to do, the Banyan Tree Lang Co offers on-site activities like archery, kayaking, and stand up paddle with Golf Course only a few minutes away. 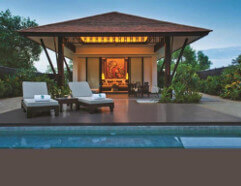 There are 56 guestrooms, mainly categorized as villas with private pools having hillside and lagoon views. The onsite 3 restaurants offer great choice of food for the guests. The hotel features a business center for business travellers and offers free cribs, children’s club, children’s pool, and babysitting services for guests with kids. The hotel is right on the beach with popular attractions like the Chan May Port, Suoi Voi, and Tam Giang Lagoon within 30 Km from the hotel, accessible easily via car rental. Some of the other amenities and services at the hotel include a fitness center, spa, private beach, tennis court, swimming pool, squash court, and hot tub. The staff at the hotel speaks fluent English and Indonesian to converse with people easily.